Once you decide where your home sanctuary will be you will need to prepare the space. You will need to clean it and decorate it. In this way, you will make the room yours. The first thing you will need to do is clean the space. This not only prepares the space for what you will bring into the room, but it also will imprint your intention on the room as a special place, different from others in your home. Sort through everything already in the room or space. Either store it somewhere else, give it away, or pitch it. Then, give the room or area a thorough cleaning. If there are windows in the space that will bring in sunshine, wash them and make them shine. Vacuum or sweep the floor, then wash the floor or shampoo the carpet. Clean any shelving or tables that are in the room. One way to really claim your space is to introduce colour into the room. 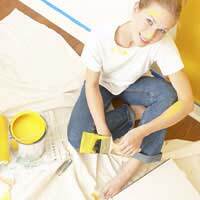 Paint is an inexpensive way to add colour and give the space a fresh feel. As you choose colour or colours for the room, remember to keep the space as simple as possible. Stripes or competing colours may make the space look too busy. Faux finishes may also draw the eye and not allow you to focus. If you want to dance, work out, or do exercise, you may want a more energetic colour. Warm colours like reds and oranges evoke energy. Reds speed up the metabolism, increase circulation, and can stimulate the mind. Red also evokes passion. Oranges and reds also tend to make people hungry. If you are creating a special place in order to work with food; then orange or orange red is a good choice. That's why some restaurants will use a form of orange in their decor. Ironically, the warm colour pink actually is a calm, soothing colour. Reds and oranges will make a room feel warmer. Yellow is a happy colour and can create a sense of optimism. However, for some people, it can be too stimulating and can cause nausea and headaches. Some people lose their tempers in rooms painted yellow. It can also stimulate concentration and speed up the metabolism. Black should be used sparingly. It tends to make a space smaller and to feel warmer. Black, however, can be a great accent colour. White is considered a colour of purity. It can also make a space feel clean and sanitised. That's why it's often used in kitchens or bathrooms. Greys are considered boring, though they could be used to complement earth tones. Greys have often been used in offices and have an industrial feel when used in homes. These colours can be uninspiring but can be a good accent colour. Earth tones like tans and browns can make you feel cosy and relaxed. These colours make spaces feel inviting. Dark browns, on the contrary, can make a space feel closed in and confining. For many reasons, painting may not be an option. There are, however, other ways to bring colour into your home sanctuary. A great way to bring in colour is through fabrics, objects, and specific materials that you will use in the space. You can introduce colour through floor pillows, draperies, or wall hangings. Art is also a great way to add colour to a room. Mandelas, complex designs in art used as a meditation focus, are usually brightly coloured. These attract the eye and make them interesting art pieces to look at as well as use to relax with. Peaceful scenes from nature in photographs or paintings can also bring in colour and provide something beautiful to look at. Textured wall hangings are also a great way to add colour. Statuary, water fountains, candles, or spa supplies can also be ways to bring colour into your home sanctuary. Whatever colours you decide to use to decorate your space, decide on a colour palate of one to three colours. One main colour will predominate while one or two others will show up as accents. Also, remember to bring in soothing textures, elements of nature if you desire, and art objects that you think are beautiful. When you surround yourself with a beautiful space with beautiful things in it and take the time to really appreciate this beauty, you will begin to relax.